For anyone interested in saying hello in person, to knock ideas around, or just tell me what you think of things, meeting up at a conference is ideal. Since I try to bring original content to each venue, the time it takes to put a presentation together is enough that I usually limit the number of presentations to 3-5 a year. This year is about over, but I do have 3 more to go on the schedule, for anyone interested. The next outing is the LED Show, which is usually held in Las Vegas, but will be at the Los Angeles Convention Center this year. I’ll be there in the afternoon of the 17th, the morning of the 18th, and for a short time after the presentation session on the 18th. I’ve been presenting at this show for several years, and always have a good, meet new people, and learn a few things. Hope to see you there. The next presentation is for members of the Chicago Lighting Club, I’ll be presenting the evening of October 20th. The topic is going to be held back as a surprise and fun for the designer types out there. 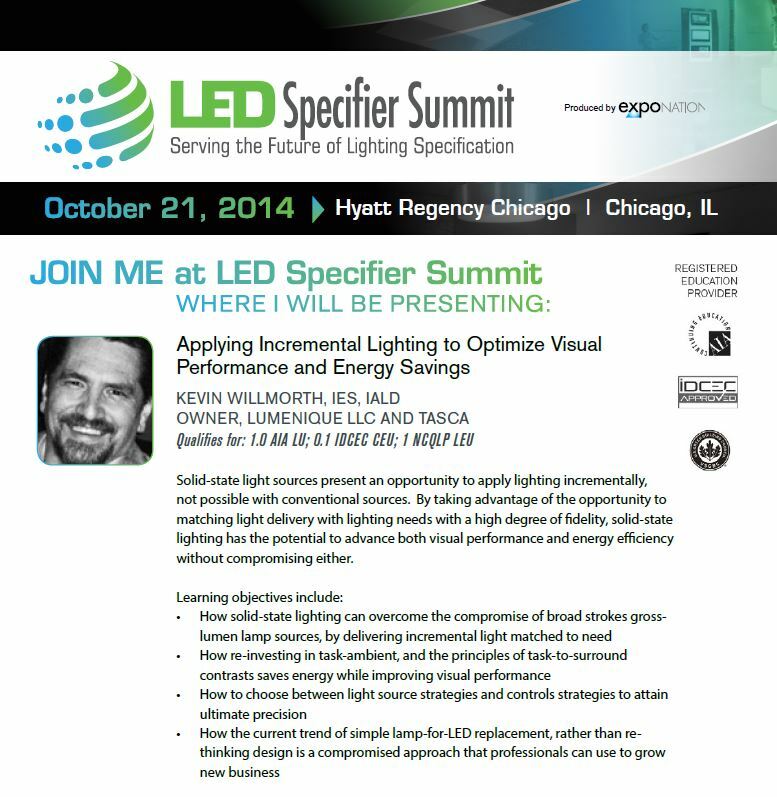 Directly following the Chicago Lighting Club I will be presenting at the LED Specifier Summit in Chicago. This is a great program and the one day format makes it perfect for busy designers to get in and out. Chicago is closer to home than most venues, so if you are in our neck of the woods, stop in and say hello. I don’t have any further planned public events on the calendar for the remainder of 2014. I do have presentations prepared on various topics for private presentations, both on a consulting basis, and for use in training sales, marketing, and design members about lighting, the lighting market, and solid state/LED technology on a practical level. If you have something in mind, let me know, we can create custom content as well. I’ll be exhibiting the UPRtek Spectrometers and MoreSpectra software at the LED Show booth 520 Moreland Lighting LLC. I’ve been in lighting over 35 years and recently made some software advancements recognized by IES, the EBU and many major players in the LED business.